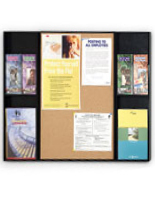 More Placement Style Options Available! 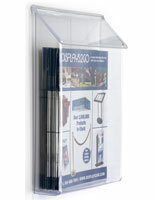 More Media Size & Number of Pocket Options Available! 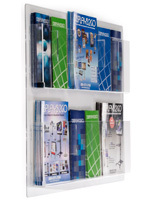 Do you need a better way to organize stacks of magazines that are otherwise flooding the counterspace in your store or office? 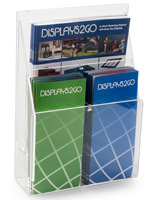 An acrylic catalog rack accommodates full-sized periodicals which can help inform your customers of new product listings, limited-time promotions, or simply entertain guest in waiting rooms. 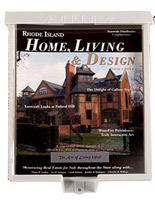 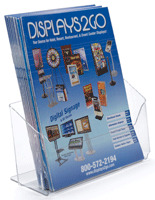 These affordable magazine displays are crafted from durable plastics which offer a lasting life. 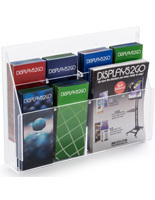 Available as single or multi-pocket acrylic catalog racks, users can present a focused selection or a wide variety of content. 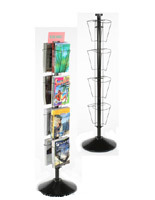 Use magazine displays while marketing brands in retail stores, offering medical information in doctors offices, or sharing local news at community centers. 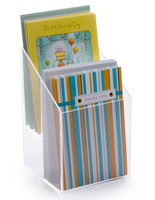 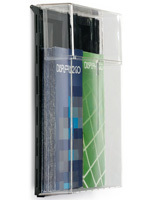 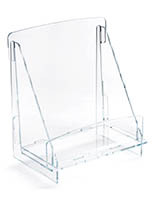 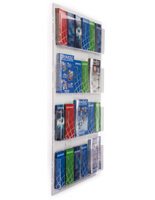 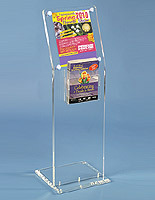 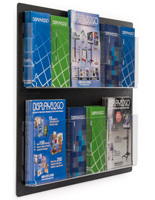 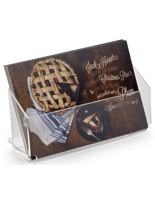 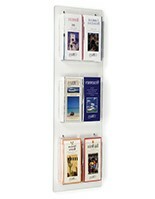 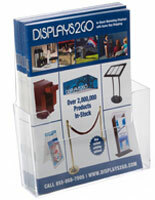 An acrylic catalog rack provides take-away information for customers to review on their own time. 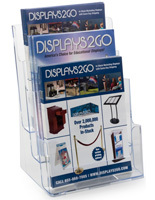 Pamphlets remind passersby of your organization's offerings and promote return business. 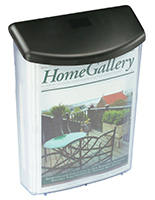 What different types of plastic magazine holders do we offer? 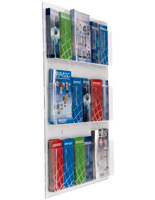 Wall mounted acrylic catalog racks are perhaps the most efficient options in that they save the most space yet can hold the largest selections. 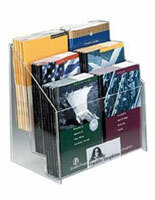 Browse multi-pocket periodical holders to showcase large quantities of promotional marketing material. 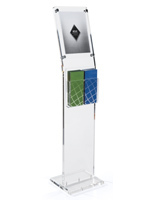 This style is most often seen in building lobbies, directories, or waiting rooms. 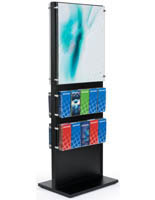 They allow organizations to share information in a centralized location for their customers. 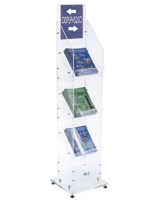 For smaller business' we offer single tiered units which are more suitable for banks, travel agencies, and even restaurants. 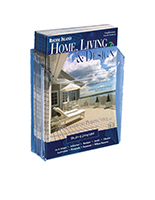 These options help businesses that need to feature a few focused listings at a time. 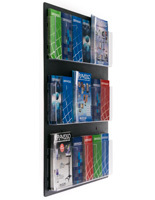 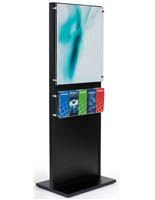 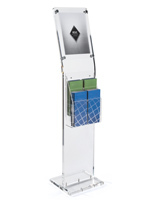 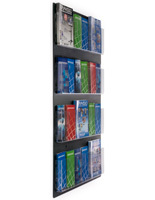 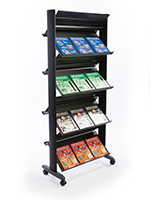 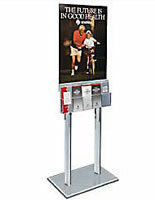 Floor standing plastic catalog racks are a highly visible and convenient way for customers to browse. 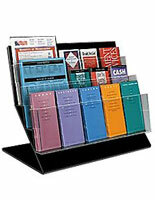 They are most effective in line, lobbies, or any busy public area. 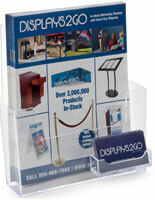 Many of these models include sign frames, ideal for adding additional branding and marketing material. 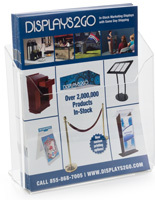 Display your company logo, custom artwork, or advertisement to draw customers in and provide them with take-home literature. 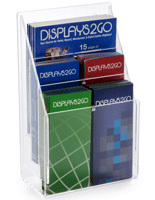 Double sided stands are great for busy malls, conventions, or large-scale events where many people can browse at the same time. 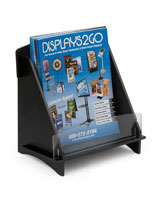 Countertop catalog racks places literature in front of your customers at checkout counters and reception desks. 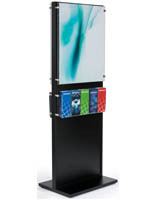 These compact tabletop dispensers put marketing material where users can explain benefits and options to customers while sending them home with supporting literature. 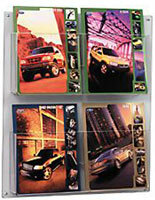 This selection features single pocket and multi-tiered designs for lager printed media displays. 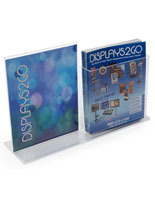 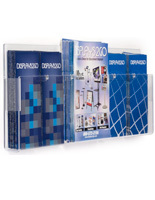 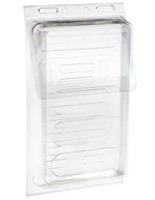 Our full sized plastic periodical holders feature clear, pigmented, and custom printed designs. 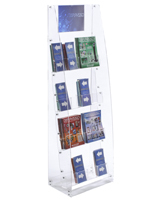 Each unit offers see through slots, ensuring that your literature is always visible while browsing. 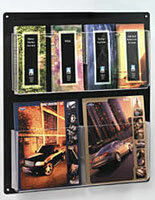 Printed marketing materials vary on usage and include brochures, pamphlets, and magazines among other niche publications. 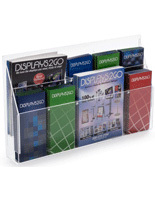 Browse our selection of literature holders with adjustable pocket dividers to equip your business to handle diversified printed marketing campaigns. 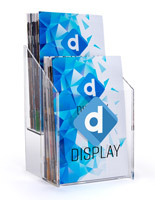 Providing your customers with take-away information to review builds brand awareness and increases exposure of your products and services.